Personalize Your Own Dazzling Denim Cuffs! 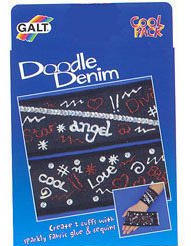 Make two fashionable cuffs by doodling with sparkly glue on blue denim! Add sequins and fasten with Velcro. Size (inches): 1.02" X 7.09" X 10.63"